Hi guys ! how are you all. Hope you are fine. I m also fine. 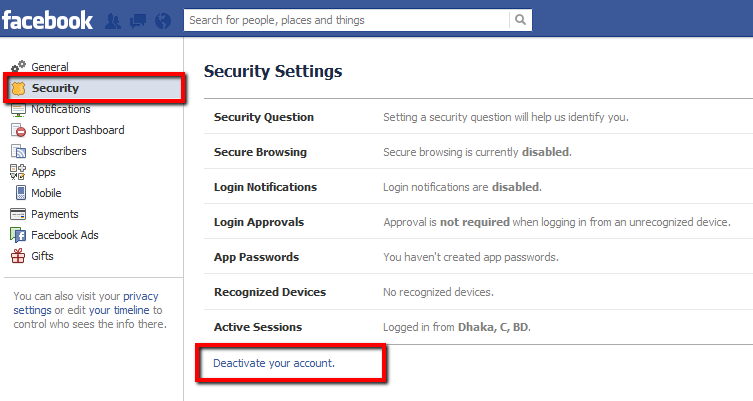 Today we are here with a new Tip name How To Deactivate A Facebook Account . This is a useful tip and I m sure that we all need it so much. In the present world, all of us has a Free Facebook account. We can’t spent a day without facebook. In social sites facebook is very popular. We need to know each and every details about it. We use it for our different types of work. So friends ! let’s know how to do it. Firstly click the account menu at the top right of any Facebook page. Secondly you must Select Settings. So guys, isn’t it simple task ? If you deactivate your account your profile won’t be visible to other people on Facebook and people won’t be able to search for you. Note: Some information, such as messages you sent to friends, may still be visible to others. When you want to come back to your account you need to do a simple task. If you’d like to come back to Facebook anytime after you’ve deactivated your account, you can reactivate your account by logging in with your email and password. Your profile will be restored in its entirety (ex: friends, photos and interests). Remember that you’ll need to have access to the login email address for your account to reactivate it. If there is any trouble then listen to me carefully. Small Talk: Friends ! if you like our tip then please give us feedback. If you enjoyed this information than like and share it with your friends and Yes, Don’t forget to do comment bellow. Thank You.